Documentation and SupportV6 User Manual BETA TablesHow do I create a Standard table? 2. Or click on the Add New Table in the navigation. Name - What the table is named. Description - What the description of the table will be. Folder - What folder the table will be located in. Backup - Do you want the table to be backed up? Order By - What field the table is ordered by. Order Direction - Wether the order is Ascending or Descending. Primary Date Field - What field is the primary date field in relation to the sorting on Dashboards. 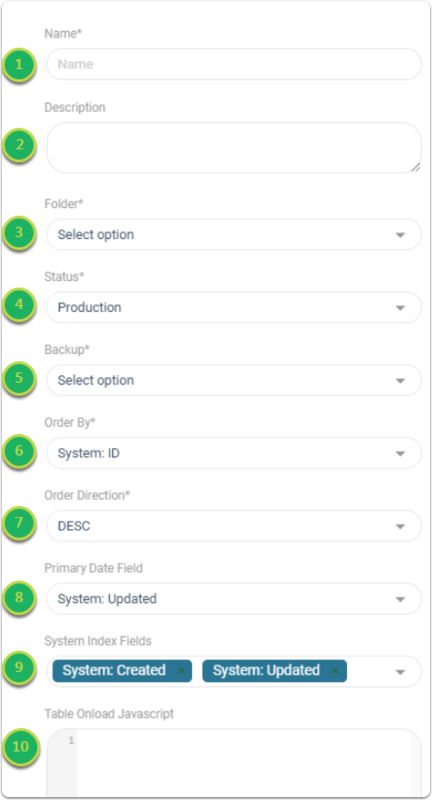 System Index Field - This allows you to index one of the system fields for quicker loads. 4. Click Standard from the datasets. 5. 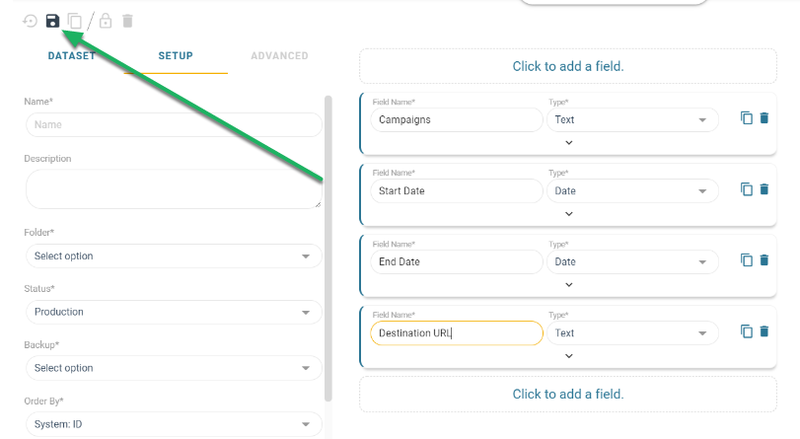 Click the 'Click to add a field' to start adding fields. 6. Click the arrow to expand the field info. 7. Select your field type. 7.1. Selecting the Text Field type. Select Text from the type drop down. Select your formatting type: Non Formatted, URL,Short URL, Account #, Phone Number, International Phone Number, Zip, Postal Code, State, or Image. 7.2. Selecting the Long Text Field type. Select Long Text from the type drop down. 7.3. Selecting the Number Field type. Select Number from the type drop down. Select your formatting type: Non Formatted, Formatted, Currency, Percent, or Scientific Notation. Set your field length, setting how many digits after the decimal place. Select if this should be a field that is indexed, which allows quicker look up for reporting. 7.4. Selecting the Date Field type. Name of the Field (Max length is 63 characters and can not include a back tick [ ` ]). Select Date from the type drop down. Select your formatting type: Date, Date/Time, or Time. Select your date value from the drop down. User Defined, Insert Date, or Update Date. 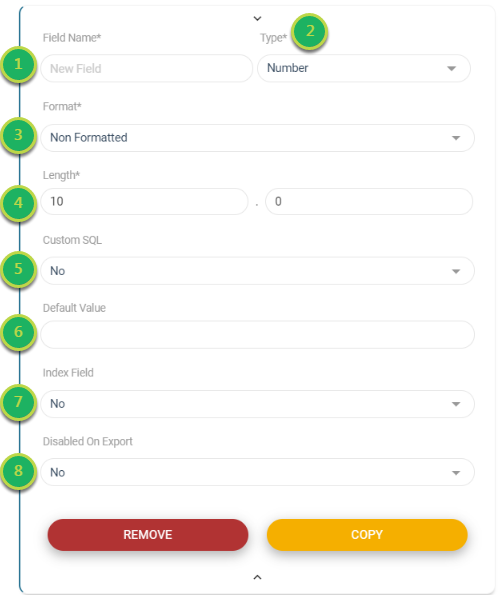 Select if this is a custom SQL field. Enter a default value if there is a value that would be entered the majority of the time, you can leave this blank. Select if this field will be disabled on export. 7.5. 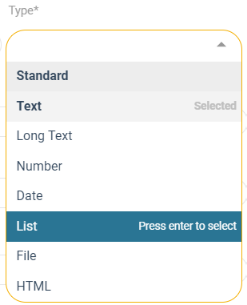 Selecting the List Field type. Select List from the type drop down. Select your formatting type: Combo Box, Combo Box Auto Update, Drop Down, or Multiple Drop Down. Select if this filed will be linked to another List field. Select how you would like the Values to be entered: User Entered or From Table. Place in your values you wish to use in your drop down. 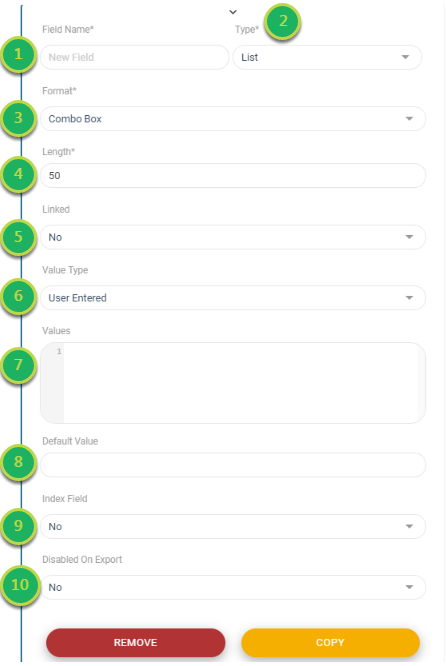 Combo Box - Allows you to pick from a predefined list. You can start to type in the box and it filters the values down. Combo Box Auto Update - Allows you to pick from a predefined list, or add a new value to that list. Drop Down - Allows you to pick from a predefined list. Can also be a linked drop down. Multiple Drop Down - Allows you to select multiple options. Can also be a linked drop down. 7.6. Selecting the File Field type. Select File from the type drop down. 7.7. Selecting the HTML Field type. Select HTML from the type drop down. 8. 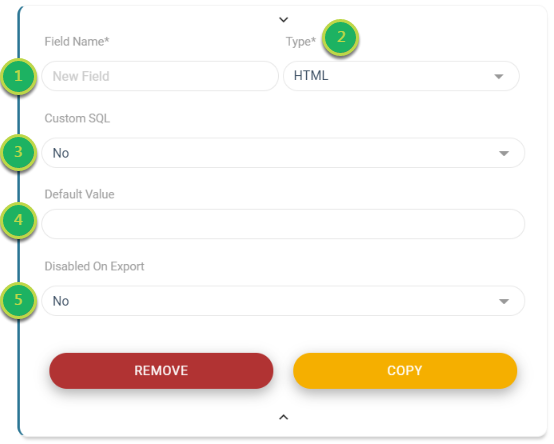 Continue adding your fields, once complete Click Save. 9. Congratulations, your table is created and you are now ready to enter data. 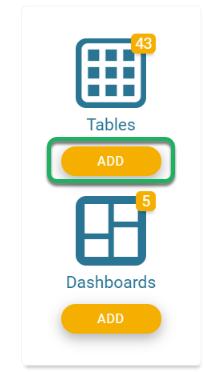 Prev: What are the Table Creation Elements? Next: How do I create a Table from Import? How do I Log In with Multiple Customers? How do I set a Default Theme? How do I create a user ? What is the Foundation's Basic Interface? What is in the Account Settings? What is the Window Switcher used for? How do I clear a form? How do I Copy & Paste data into a Form? How do I submit multiple entries into a Form? How do I Create a User Specific Form URL? What tools are on the Toolbar? What are the Title Menu options? What are the Configuration Tool elements? What are the available System Fields? What Tools are in the Right Click menu? How do I Select Records? How do I Refresh data in Fix? How do I change the number of Records seen in Fix? How Do I Add Records? How do I Copy records? How do I Edit records by text? How do I Delete records? How do I Import records via Copy & Paste? How do I Import records via a Manual File Upload? How do I Import records via Drag & Drop? How do I Export a File to desktop? How do I Export using a Connector? How do I Export a File to Email? How do I Export a File to Web? 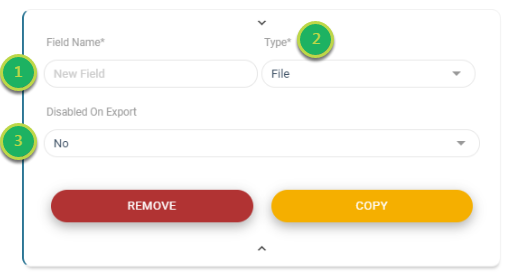 How do I Export records via Copy & Paste? How do I see specific field/cell/column content if too large in the grid? How do I set a cell to NULL? How do I Filter using With This Value/Without This Value? How do I create a Pivot View? How do I Reset Grid View? How do I Delete ALL records? How do I view the Collaborative Space? How do I Freeze column(s)? How do I limit my Data by Limiting the List? How do I Find and Replace within a Column? How do I Expand a column? How do I Expand All column(s)? How do I Quickly Filter? How do I Adjust my Column Width? How do I manage which Fields are shown in the view? How do I manage what Order Fields are shown? What Formats can be used inside the Configuration Tool? What Preps are available in the Configuration Tool? How do I change what is shown for a Field Name? How do I create a View Mashup Field? How do I Filter in Fix? What are the available filter types? How do I create Advanced Filters in Fix? How do I manage the Sort Order of my Data? How do I Clear Filters? How do I save my configured View as a Table? How do I save my configured View for later? How do I remove a saved View? How do I open a saved View? How do I create a Conditional Formats? How do I edit a Conditional Formats? How do I remove a Conditional Format? How do I create a Column Flare? How do I create a Line Flare? How do I create a Spline Flare? How do I create a Area Spline Flare? How do I create a Area Flare? How do I create a Stacked Area Flare? How do I create a Stacked Column Flare? How do I create a Bar Flare? How do I create a Stacked Bar Flare? What are the Flow Configuration Tool Elements? How do I create a new Flow? How do I modify a Flow? How do I create a scheduled Flow? How do I create a Flow that is triggered when a specific Form is filled out? How do I trigger a Flow to run after another Flow? How do I create a Form from Flow? How do I open a Form from Flow? How do I modify a Form from Flow? What are the File Tool Elements? What are the different types of fields available? How do I edit the Table Info? How do I edit a Field? How do I remove a Field? How do I remove a Table? How do I add Values to a List Field? How do I create a Workspace? How do I add a Table to a Workspace? How do I add a Form to a Workspace? How do I add a Dashboard to a Workspace? How do I edit a Workspace? How do I Remove a Workspace? How do I edit a Folder? How do I remove a Folder? What are the different types of tables available? 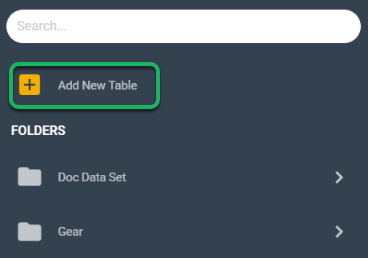 What are the Table Creation Elements?